Kevin and Heather Harvey have a policy of not accepting orders. 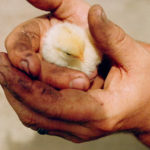 We believe that we do our best work when we make what we are inspired to make and then offer it for sale. We hope you understand. 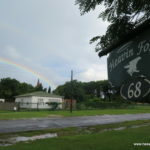 Heavin at the end of the rainbow. 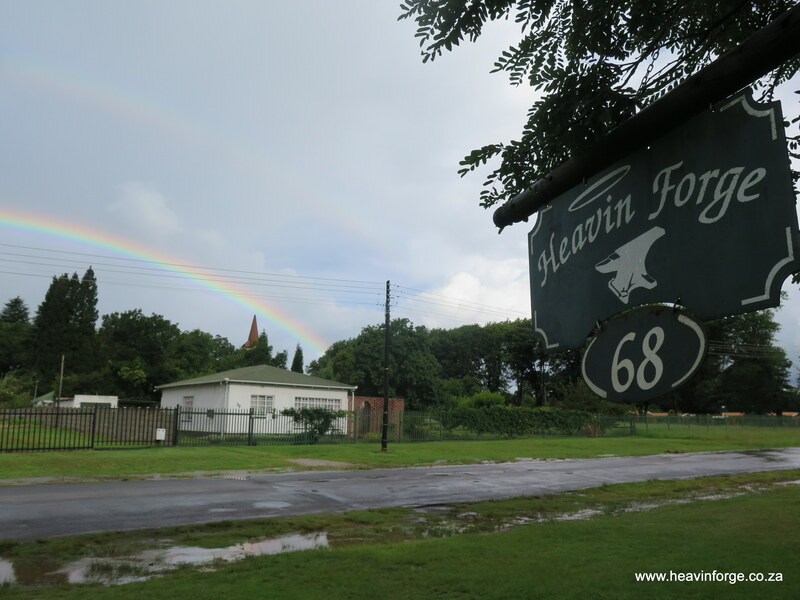 The knives that we have for sale can also be viewed and purchased from our showroom at Heavin Forge in Belfast, South Africa. If you are in the area, we would love to show you around our workshop and showroom. Please phone first for an appointment – 013 253 0914. We try to always have a few knives for sale on our website and in our showroom. Please scroll down to see what we have available. We work hard to have stock for sale at the show we attend, namely the Knifemakers’ Guild of Southern Africa annual show in Johannesburg, South Africa. 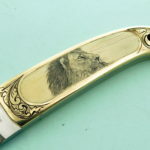 We also have knives for sale through our agent in the U.S.A, BladeGallery.com, they ship around the globe, http://www.bladegallery.com/shopdisplayproducts.asp?id=194&cat=Harvey%2C+Kevin%2C+M.S. 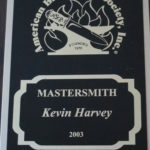 When a knife is made entirely by Kevin Harvey it is marked, “Kevin Harvey, M.S.”, the M.S. stands for Master Bladesmith, the highest rating in the American Bladesmith Society. If the knife is marked “Heavin Forge” it means that it was made by Kevin Harvey while teaching a class at Heavin Forge. This will be the knife made alongside students by Kevin demonstrating each step in the bladesmithing process. All knives come with a “Certificate of Origin”. WHAT MAKES OUR KNIVES SPECIAL? We would like to point out why our knives are highly collectable and what sets them apart from other knives. Each knife we make is a once-off creation, we don’t work from templates or laser cutouts or make use of CNC machinery. 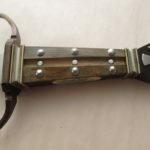 The knives never leave our workshop, every step of their creation from the initial forging, heat treatment, hand embellishment and leather work is done with our own hands. We pay particular attention to the smallest detail and take great pride in always making the best knife that we can possibly make. This does make our knives more time consuming to produce, but you get a unique, lovingly created investment that should last generations. Our knives are superior tools, not wall hangers and are tested for performance regularly. 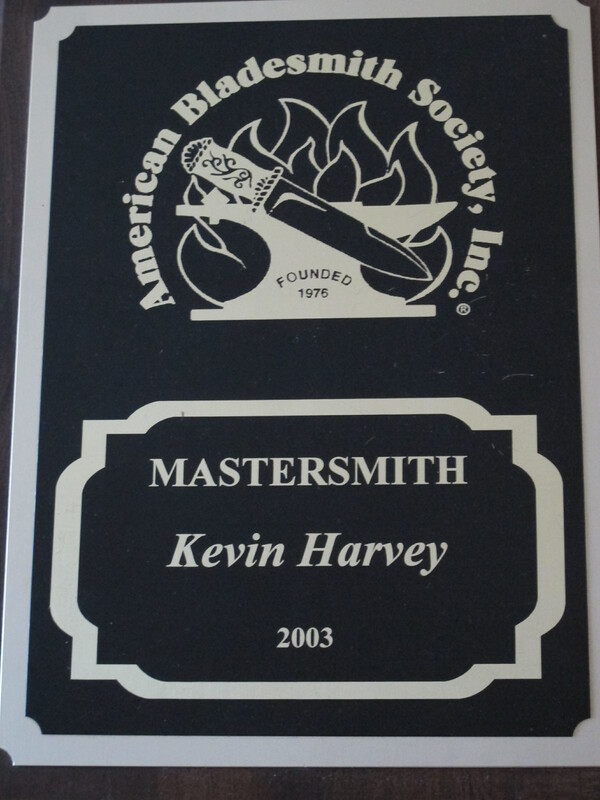 Spending years striving towards achieving our certifications with both the American Bladesmith Society as Master Bladesmiths as well as the highly respected Knifemakers’ Guild of Southern Africa, is proof that our work has been recognized and commended by our peers. A few aspects that make our work distinctive are the pleasing artistic lines, ergonomically sculpted handles, typical forged blade geometry’s featuring flat ground bevels, distal tapers and convex cutting edges, differential heat-treatment (hard edge, tough spine) as well as balance and scary sharpness. 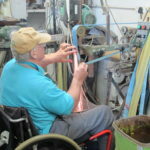 All our money earned is put back into our workshop as well as into learning new skills to better enhance our art. We will never be rich but we are passionate about our craft, share our knowledge willingly, encourage new bladesmiths and are all about, “making a life, not making a living”. This is not a job, it is a passion. Part of the money we charge per knife goes into hand-cleaner and band-aids! 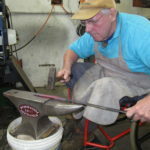 Working your fingers to the bone is what knifemaking is all about. Each knife takes a little bit of our soul, skin, a bit of blood, a lot of sweat and hopefully no tears! Don’t worry, we clean our blades before we sell them and we wash our hands before eating! The next time you attend a knife show, have a close look at the maker’s hands. Our wish is that when you buy a knife from us, that the knife serves you faithfully and will be in your family for many generations. 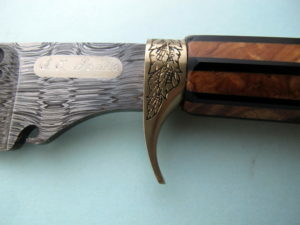 Don’t just buy the knife for youself, consider it as a family heirloom. All prices are listed in South African Rands and do not include postage. We do accept credit card sales but we are not able to accept payment through the website for credit cards. If you would like to buy a knife using your credit card, may we please ask you to phone us during working hours on 013 253 0914 to give us your details. 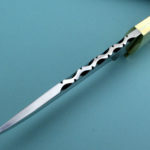 In this way we can also make sure that the knife is still available as it may have recently sold out of the showroom. Knives will only be mailed after payment has cleared in our account. We also accept payments into our account with ABSA bank, again, please phone for the account details and to check that the knife you want is still available. For door to door couriers, we can give you a quote once we have your physical address, on average it is R200 within South Africa. 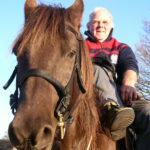 We are not on a major route, so our courier only collects twice a week. You are welcome to arrange your own courier to collect the parcel. We can give you a quote on overseas couriering, we do not use the Post Office. What makes our knives highly collectable is the effort we have gone to, to get the highest possible international ratings. The ratings we have achieved are from many years hard work, testing and evaluation by our peers, they are not just clubs that we belong to, we have had to prove that our work is of the highest standard in the world. To become a member of the Knifemakers’ Guild of Southern Africa requires you to submit 5 knives for evaluation by three Guild members. If your work is of a high enough standard you will be awarded your Guild status. It is not just a knife club that anyone can join. The standard of work by our Guild members in South Africa is highly regarded by overseas collectors. Please look at the Guild website for more information, www.kgsa.co.za. 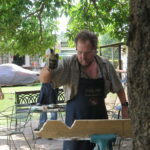 Kevin and Heather are members of the Knifemakers’ Guild of Southern Africa. Kevin is the chairman at present. 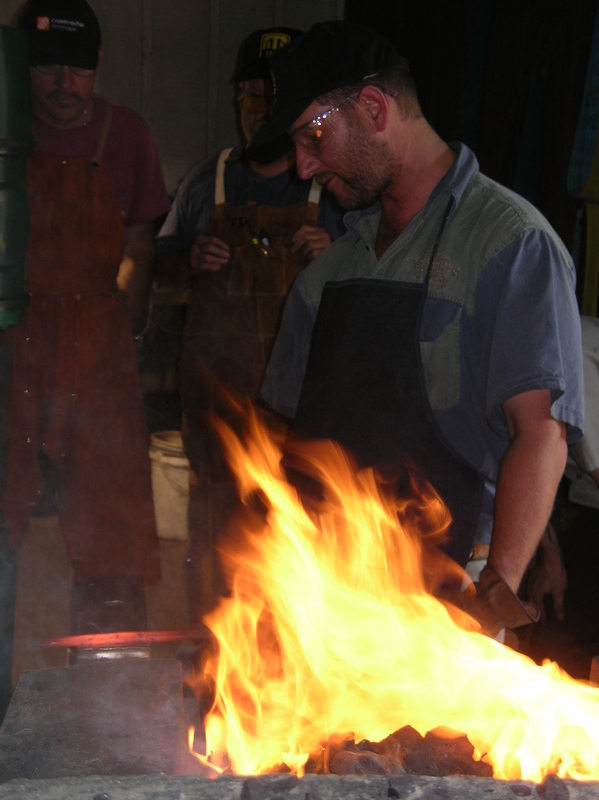 To become a Master Bladesmith requires a total of at least 5 years apprenticeship and journeymanship. 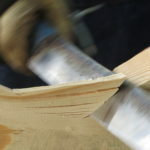 First there is a three year apprenticeship with the American Bladesmith Society before you can do your cut and bend test which requires you to cut through a 1″, free hanging sisal rope with one swipe, cut through a 2″x 4″ pine beam twice and without sharpening your knife you must still be able to shave arm hairs. The last test is to put the knife in a vice and bend it to 90 degrees without it breaking. You have to pass this test with a 10″ knife that you have forged and finished yourself from carbon steel. You then have to submit in person 5 knives to a panel of judges at the annual Blade Show in Atlanta U.S.A. If your work is good enough and you passed the cut and bend test you will get your Journeyman Smith rating. Two years after being a Journeyman you can do the cut and bend test again with your own damascus knife and submit 4 damascus and carbon steel knives along with a set piece damascus quillion dagger, in person to another panel of judges at the Blade Show in Atlanta and if your work is of exceptional quality you will receive your Master Bladesmith rating. There are only around 110 Master Bladesmiths in the world. 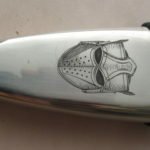 For more information on the American Bladesmith Society please look at their website, www.americanbladesmith.com. 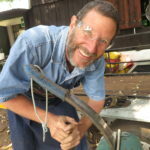 Kevin and Heather are the only two Master Bladesmiths on the African continent and the second married couple Master Bladesmiths. 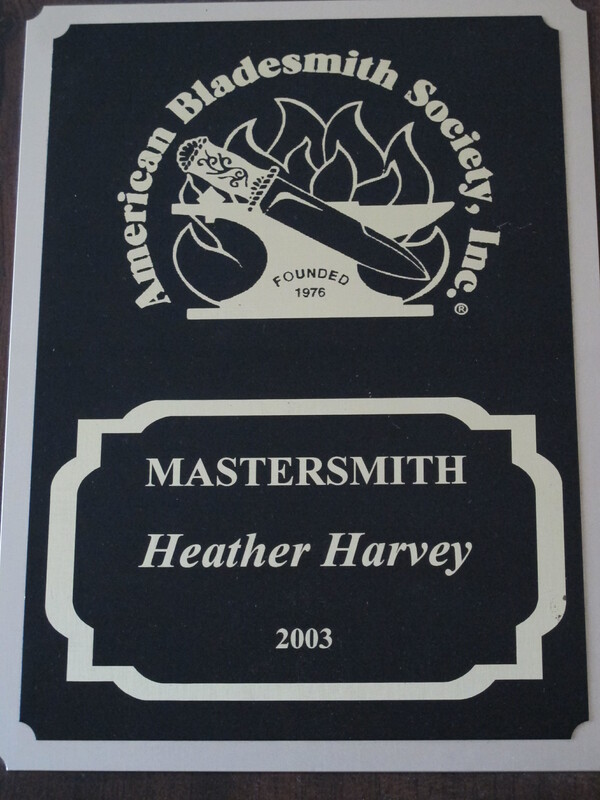 Heather was the second lady Master Bladesmith in the world, there are now four. To view Kevin bending one of his forged knives, multiple times, please click here. Knife surviving 90 degree bend. 2″ x 4″ wood chop. To watch ABS Journeyman Smith, Neels van den Berg passing his performance test click here. “When you buy from an independent artist you are buying more than just a painting or a novel or a song. You are buying hundreds of hours of experimentation and thousands of failures. You are buying days, weeks, months, years of frustration and moments of pure joy. 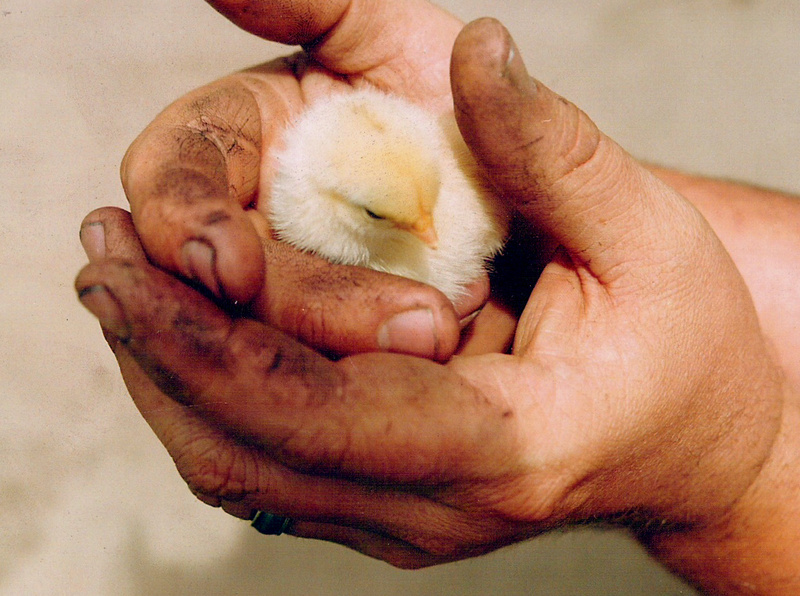 You are buying nights of worry about paying the rent, having enough money to eat, having enough money to feed the children (horses), the birds, the dog. You aren’t just buying a thing, you are buying a piece of heart, part of a soul, a private moment in someone’s life. Most importantly, you are buying that artist more time to do something they are truly passionate about; something that makes all of the above worth the fear and the doubt; something that puts the life into the living.” Rebekah Joy Plett. Not all the new knives are at the top of the page – scroll down! Please note that this is not a catalogue as each knife is individually made and will not be reproduced. What we show here is what we have at present for sale in our showroom. 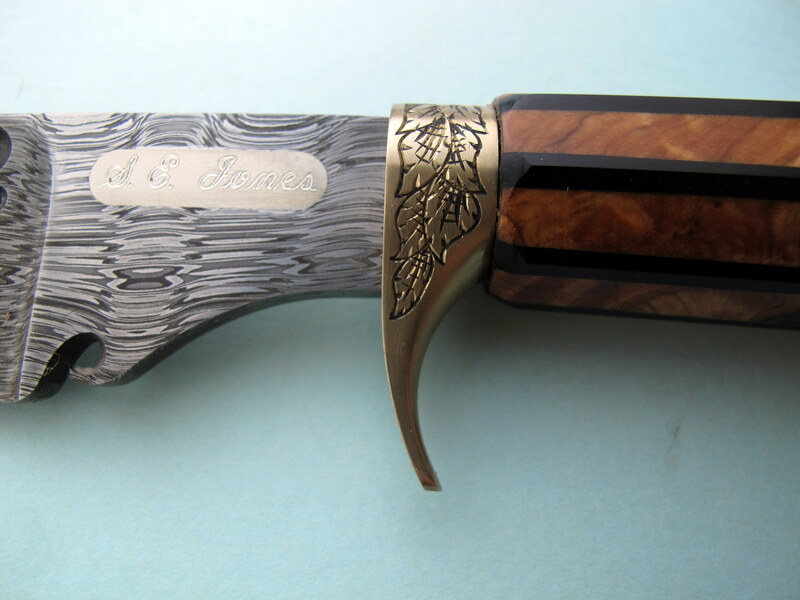 Our neighbour, Sid Jones, makes knives too. 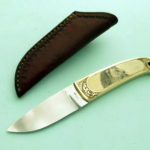 Here are a few of his knives for sale through us or from his website,www.knifecraft.co.za. 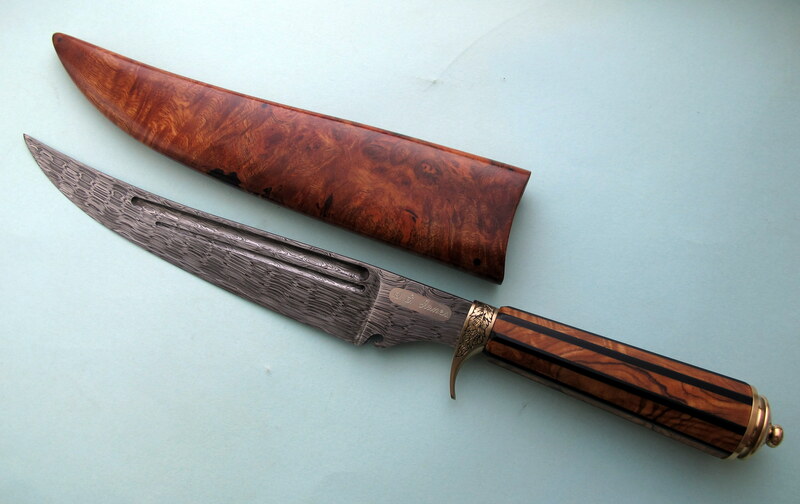 215 mm long blade of Kevin Harvey “Modified W’S” pattern damascus steel with two fullers. Wild Olive (Olea europea sbsp africana) handle with inlays of African Blackwood (Black Ivory). 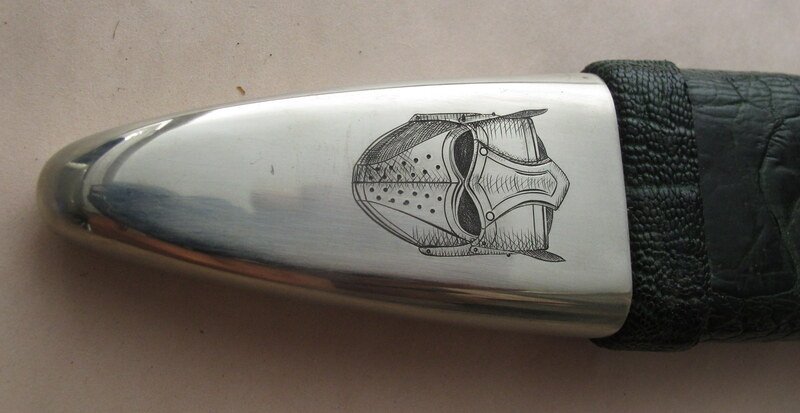 Brass pommel with filed grooves. 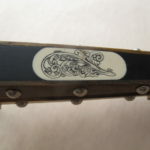 Aluminium bronze guard with floral engraving by Kevin Harvey. Scabbard of African Wattle Burl wood (Peltophorum africanum). 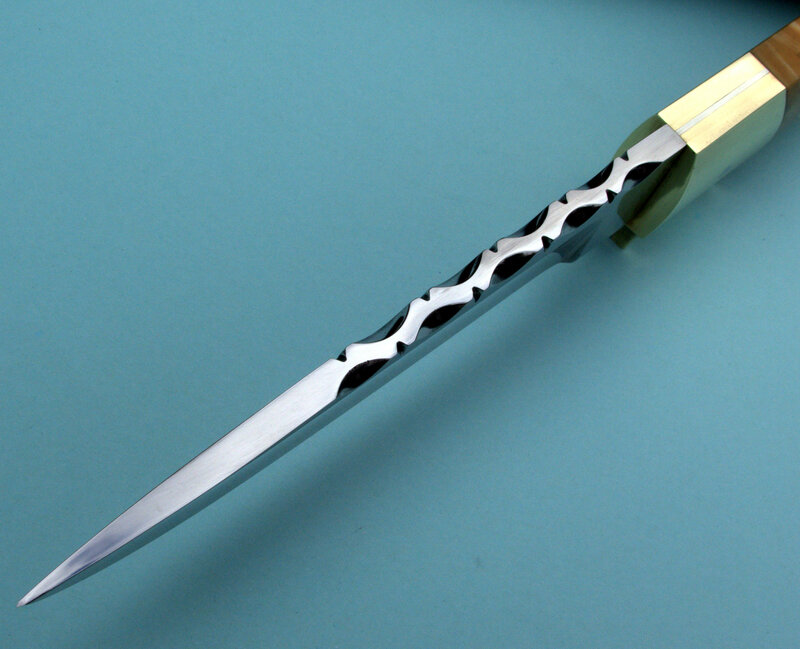 225 mm long blade of Bohler N540 stainless knife steel. Double edged dagger. 56 Rc hardness. 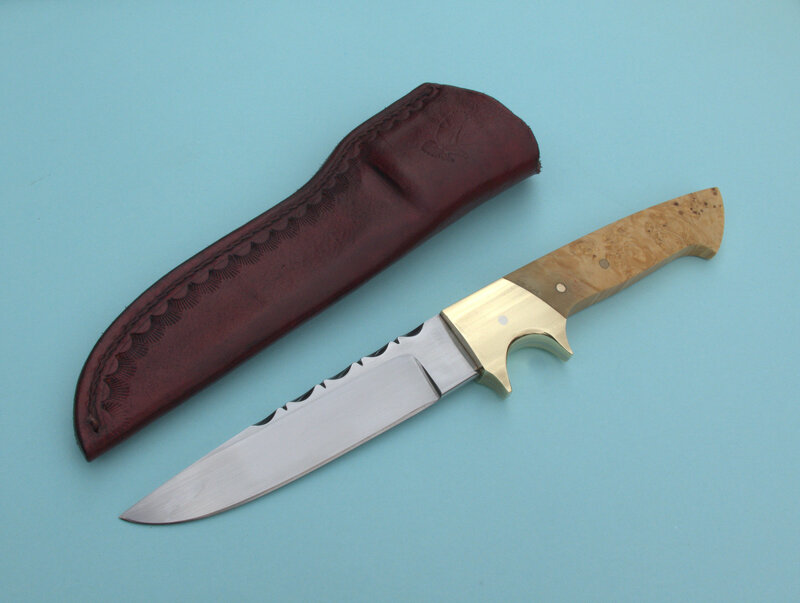 Handle of Lignum Vitae and warthog ivory inserts with fine carving by Kevin Harvey. Guard and pommel of gun-blued mild steel with nickel silver Maltese Crosses. Spacers of nickel silver and brass. 303 stainless steel studs and pins. 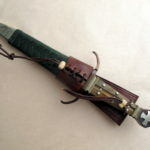 Scabbard with wooden core covered with green ostrich shin leather. Removable buffalo hide belt loop with lacing. Nickel silver tip engraved by Kevin Harvey. 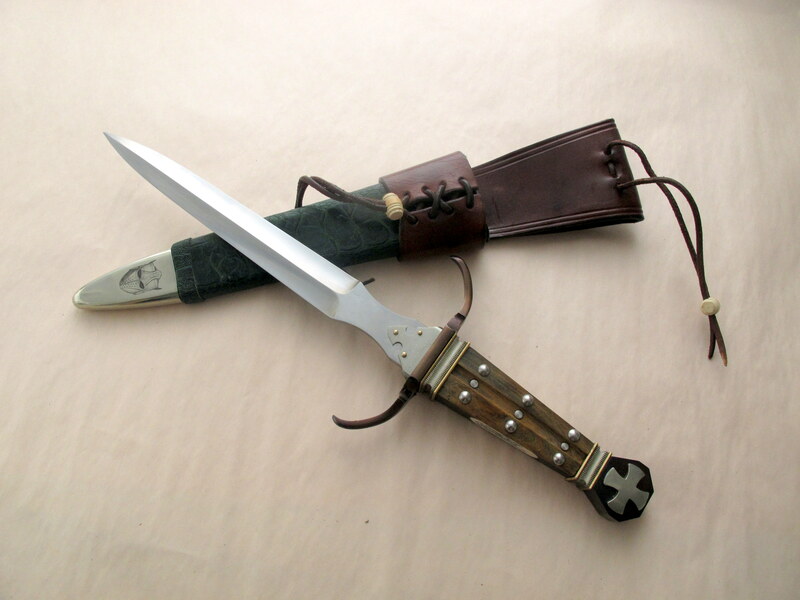 Dagger inspired by the sword used in the movie “Robin Hood” featuring Russell Crowe. 120 mm long blade of Bohler N540 stainless knife steel with a hardness of 56 HRC. Stabilised Box Elder Burl wood handle with brass sub-hilt guard. File work on spine. 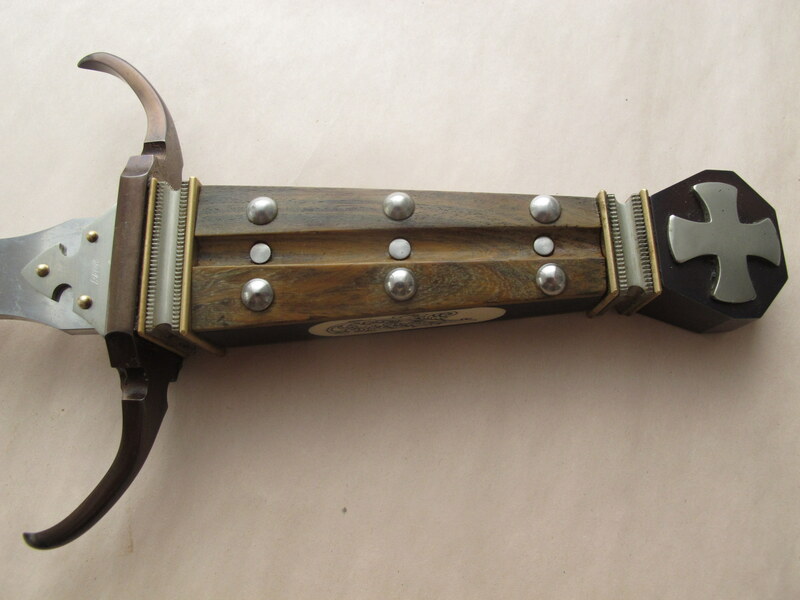 Brown cowhide sheath with embossed border and eagle stamp. 105 mm long blade of 12C27 stainless knife steel with a hardness of 58 HRC. Tambotie wood handle with bolsters of 303 stainless steel. Brown cowhide sheath. Pon Burger from Zimbabwe made this knife many years ago. 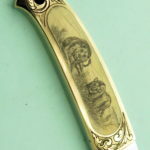 Stainless knife steel blade with brass handle with engraving. 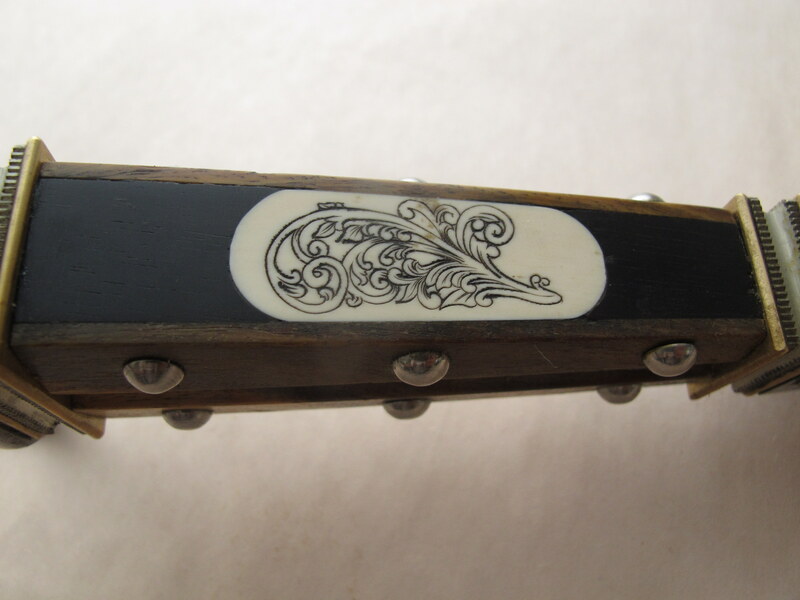 Inlaid ivory scales with lion scrimshaw by Toi Skellern. Pre-owned in good condition. Price R3 400. Carbon and Damascus steels can rust if not cared for. Here are a few tips on keeping your knife rust free. 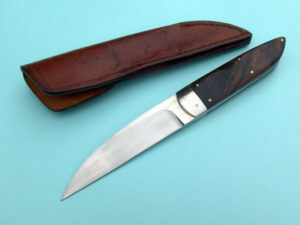 Firstly, don’t confuse rust with a patina or stain that may appear on your knife after cutting something acidic. This is normal and adds to the character of your knife. Damascus and carbon steel knives and swords have been around for thousands of years, so with care, you can own a future antique! To prevent rust, do not store your knife in its leather sheath, as the leather picks up moisture and can cause your blade to rust. Rather oil or wax your blade and wrap it in a soft cloth for storage. Use the sheath only when you are using or wearing the knife. Wipe off the oil or wax before preparing food. Do not wash your handmade knife in a dishwasher. Wash the blade by hand in warm soapy water; avoid getting the handle overly wet, do not let it soak in the water. Dry immediately, don’t leave it to drain in the drying rack. 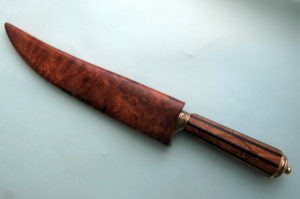 Oil the knife with olive oil if it is used regularly in the kitchen or with gun oil or Harvey’s Conservation or Renaissance Wax when storing. Remember to oil or wax the handle too. If rust spots appear, rub the blade with a metal polish like Brasso or a very fine (0000) steel wool, then oil or wax the blade. Do not use oil with silicon in it as this can cause rust. We guarantee our workmanship but natural handle materials cannot be guaranteed, they can and do shrink and expand so may crack. Do not leave your knife lying in the direct sunlight or near a heater. Use your knife for what it was designed and keep it sharp. A knife is an inanimate object and is only dangerous in the hands of the careless and the inexperienced. Remember that your knife comes with a free lifetime sharpening service from Heavin Forge. Price: R20 for 10 g, R65 for 40 g, R200 for 200 g and R800 for 1000 g. AVAILABLE FROM KNIFE MACHINES AND TOOLS, www.kmts.co.za, Phone 067 078 0420. Handmade by ourselves. 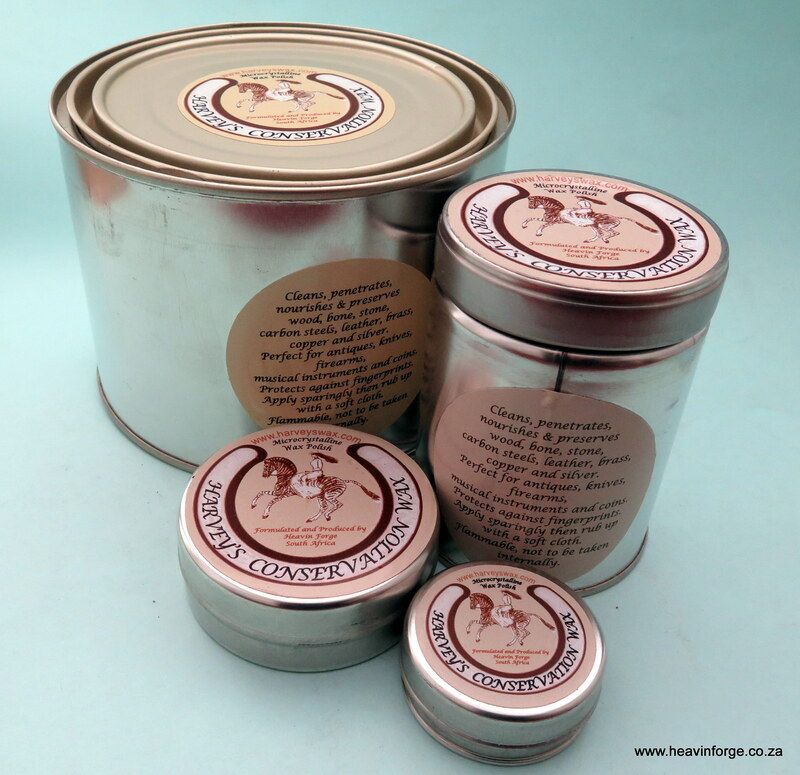 This microcrystalline wax cleans, penetrates, nourishes and preserves wood, leather, damascus and carbon steels, bone, stone, ivory, horn, silver, brass and copper. 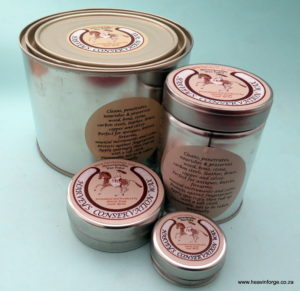 Perfect for the conservation of antiques, knives, firearms, musical instruments and coins. Protects against fingerprints. This is a hard wax to prevent you from using too much of it. 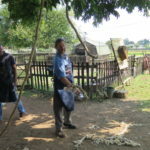 Preferably lightly warm item to be waxed with a hairdryer to aid penetration of wax, (do not heat ivory). Apply wax sparingly. Rub up with a soft cloth when dry.